Furthest thing from my mind, buying a new bike for the grandchildren. Then I traveled to Mount Airy, North Carolina, where I stopped in at the bike shop to figure out how to pedal around the gorgeous Yadkin Valley with all its vineyards and classic-crop farms. Tiniest little bicycle I’d ever seen that wasn’t a toy was right there in front of me. Since this bike shop is also an art gallery, I thought it might be sculpture. Wrong. Within in hour I was convinced the pre-schoolers in my multi-generational blended family needed what I learned was a balance bike. No pedals. No training wheels. Just two tires, a tiny hand brake and a sleek design. 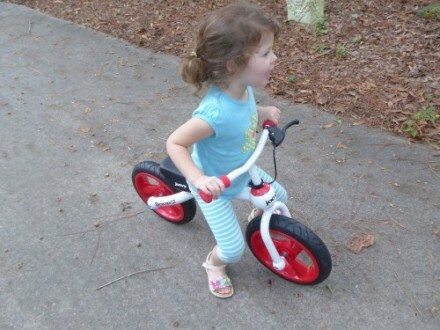 Joovy is what we now call our little bike, one of 42 products for families with very young members. That’s actually the company name but it was easy for our 3-year-old to say, and to read the letters, so it stuck. Since when was bike riding also a cheerful literacy exercise? The bike shop owners in their sleek athletic clothing shared testimonials about families whose little kids skipped right over the training wheel and tricycle phases. Balancing when low to the ground was the key. Instead of buying theirs, I continued on my journey and asked Joovy the next week to share one so I could review these claims with grandchildren, great-grandchildren and a gaggle of pre-schoolers in a home-based center near my south Georgia home. Everybody fell down. Nobody got hurt. Nobody was discouraged. 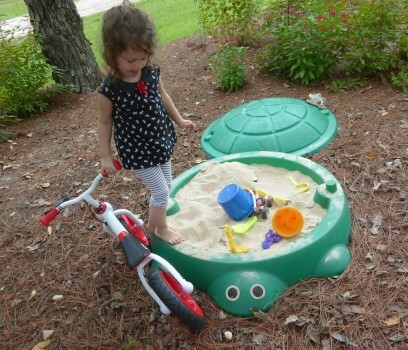 Set on 12-inch pneumatic tires, the aluminum frame is so light and so close to the ground, the tumbles seemed softer than a fast-running 3-year-old. We rode in the grass and on a brick sidewalk. 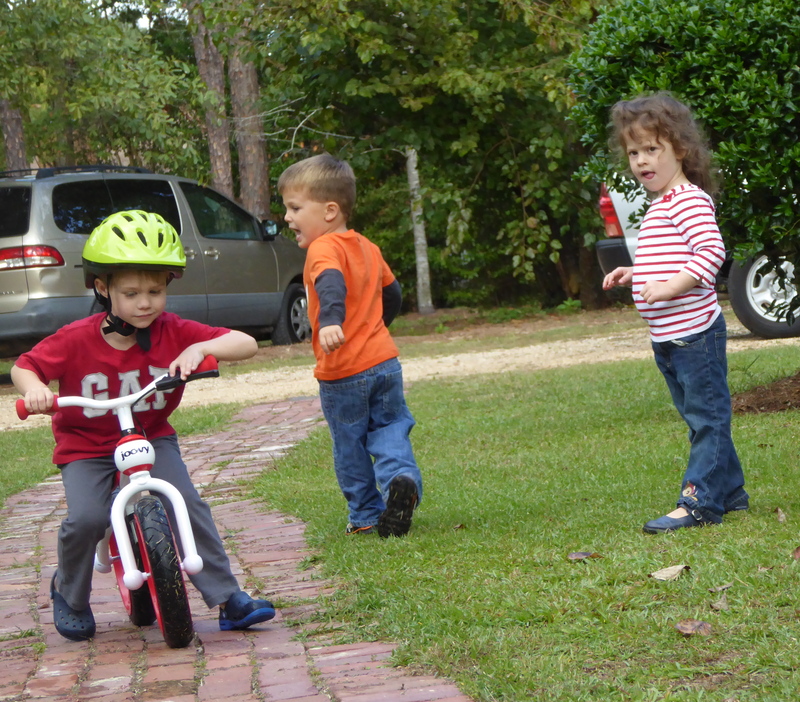 Tried the neighbors’ paved driveways to gain some speed, but the inclines disturbed each rider. The point seems to be this: Sit on your balance bike and make it move by walking your feet. Then lift them up to coast a bit. Bingo! Presto! Balance feels comfortable and familiar. Or so I hear. I appreciated the lightness of this simple design, especially when my 3-year-old preferred to park her Joovy at the sandbox near the swingset across the street. It was truly no trouble for me to carry each time the novelty of balancing wore off. I think the balance bike would fit in the overhead compartment should one take it on a flight. For certain I’ve easily transported it on the 200-mile-road trip between my home and hers – both in the trunk with other luggage and sharing the backseat with her safety seat and her grandfather’s oxygen tank. Compact, lightweight, inviting in its sleekness. But I can’t say yet anyone’s ready to move into a yoga tree pose, or even balancing very long on the bike. Order a Joovy called a Bicycoo like mine for $149.99. Choice of colors: red, black or white. The shipping box is fun to climb in too, a slim rectangle my granddaughter could pretend to hide almost fully stretched out. We kept it too. 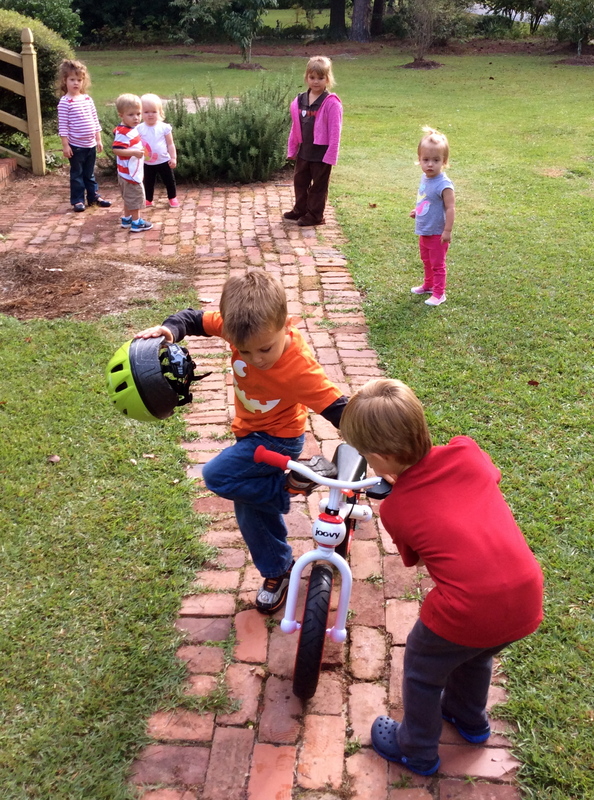 Plan to put the balance bike together but don’t fear the challenge. Joovy even provides the tool you need. Only momentary challenge in my house was adjusting the seat. The website of this Dallas, Texas, company has a store locator link and a page of flags for international purchases. Nice place to engage your little one in a coloring game with the flags and maybe a bit of cultural heritage conversation. “noodle,” and sells for $29.99, also in five other colors. Hot-headed, hard-playing kids will appreciate the 14 air vents. The noodle seems to fit heads up to 20.5 inches. If you like biking with your kids, check out this family bike trip in New York City.